To blog or not to blog. Why? Questions that probably haven't bothered you. Today I realized "Why not?". I mean really, what's the worst that could happen? You'll all ignore me and I'll just be talking to myself anyway? Which is how I spend most of my time, so again, why not? And so I launch into the blogosphere. I intend this to be my ruminations on the world of fishing, fly fishing in particular, with a few nods to my other outdoor activities. I've learned a lot about fishing the last couple of years, but like so many areas of scholarly pursuit, the more I learn, the more questions I have. 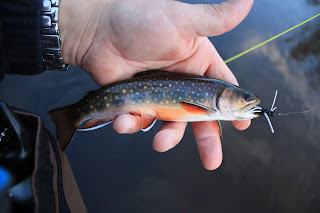 For you Philistines out there, Fontinalis refers to Salvelinus fontinalis, the Latin name for Brook trout. 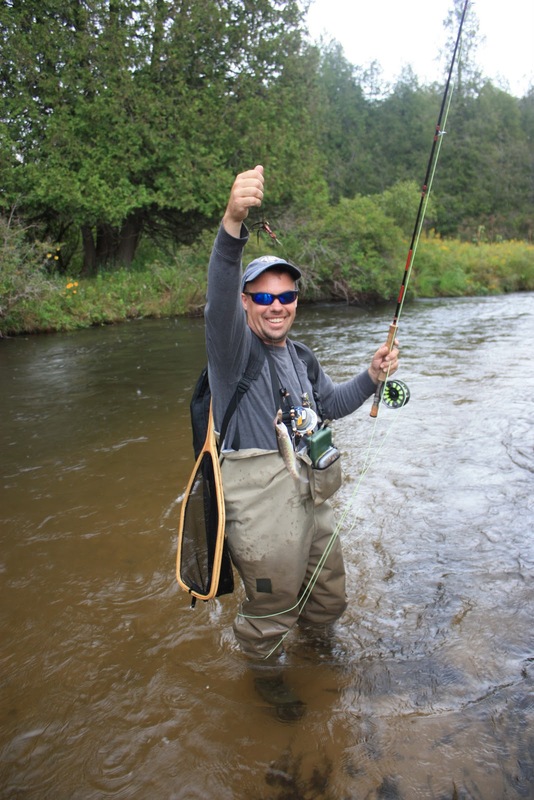 I love brawling with browns and stalking steelhead, but brook trout will always have a special place in my heart. 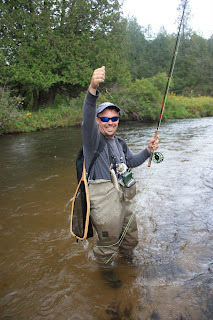 Prime brook trout water always seems to be that much further out there, more remote, harder to reach, more peaceful. If you could distill nature and wilderness and beauty, put it in liquid form and give it fins, you'd have a brook trout. Topics I plan to cover will include fly tying, fishing in general, ethics including catch and release, humor, women in the outdoors, techniques, patterns, people in the outdoors and so on, i.e, exactly what everyone else is doing- you'll have to let me know if it's different or stands out in any way. I also plan to publish my takes on the return of wolves to Michigan, the DNR and so on- I'll try to keep it interesting and varied. In case anyone is interested, I WILL NOT cover specific locations or sensitive fisheries, or name associates who wish to remain unnamed in a public forum. This is not a tell all, but more of a recounting of the things that keep me awake at night. You're more than welcome to post a comment, but, please, save any vitriol for your favorite politician/lawyer/ex. Go start your own blog, there's a link at the top of the page. I especially want to state that I am an apolitical person, and my comments are personal opinions, not political statements. More than anything I hate the politicizing of an activity that I view as above politics. 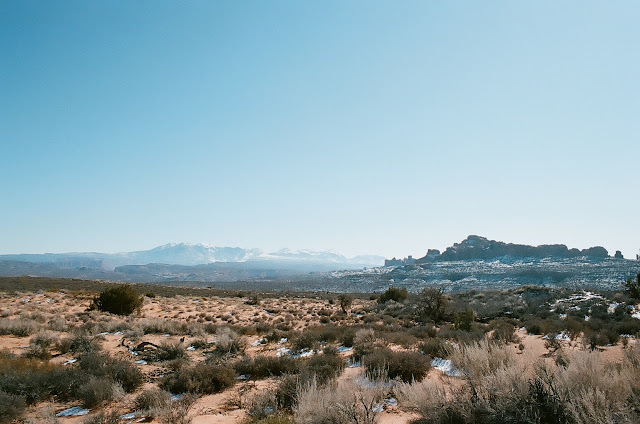 I will simply try to state my opinions as they relate to the outdoors; you can conclude what you like. So that's it, I'm in. As the drink machine designed by the Sirius Cybernetics corporation which was installed on the spaceship Heart of Gold in the "Hitchhikers Guide to the Galaxy" series used to say, "Share and enjoy!" Off to a nice start J. Love the picture!!! Awesome! I love to read anything that you write. Nice start on your blog! You are very literary in your thoughts; I look forward to what you will say. But just as a point of debate I do not ignore what you have to say in fact I find it very intriguing. So put pen to paper or finger to keyboard and inscribe that intellect on the web for all to share. Fantastic first post! The name is awesome, I am intrigued and hungrily await the future ruminations. Nice Jason, thank you for sharing. You have to put something about your famous vegetables on there for us vegetarians. Thanks lilmoonchild- it will be my fly-fishing, photography, cooking and kayaking blog. Nice to hear from you!